Introduction - It seems that the Mulholland Co. switched to diners by 1925. A 1972 article from an Olean, NY newspaper talks about the old State Diner. The first owners were the Gillsons. Their son, Wallace Gillson, worked for Mulholland. He would find a location that he felt was suitable for a diner, and find an owner, (maybe there was already an owner, but no suitable location), and help to set the diner up and get the owner ready to run the diner. Sometimes, this meant bringing in a cook to help start up the diner. He even helped his parents find a location in Olean for their Mulholland dining car. On April 6, 1925, the diner opened for business. Also, in the book, "Diners of Pennsylvania", there is a picture of the Union City Dinor, that is dated 1926. But back to Wallace Gillson. The newspaper reported that he helped to sell 32 Mulholland Diners from 1925 to 1929. In 1929, he left Mulholland to help his parents at the State St. Diner, which he would eventually buy and run until 1946, when he sold it to Joseph Magnano. The article also stated that the diner had booth seating for two, over the wheels, at each end of the dining car. The Mulholland company alsso had more help in selling their diners. In September of 1925, the Dunkirk Dining Car Co. was formed with a purpose of selling Mulholland dining cars. Previously, the earliest Mulholland Diner known was "The Eat Shoppe", that was sent to Oneonta, NY in Nov 1928. It had also been documented that the company sent out a letter in May of 1928 to a gentleman interested in the diners, in Roscoe, NY. The Mulholland Co. was listed in the 1930 Dunkirk city directory. The company was not listed in the 1935 city directory(the next available city directory). Diners - The company built two types of diners, both made in segments. 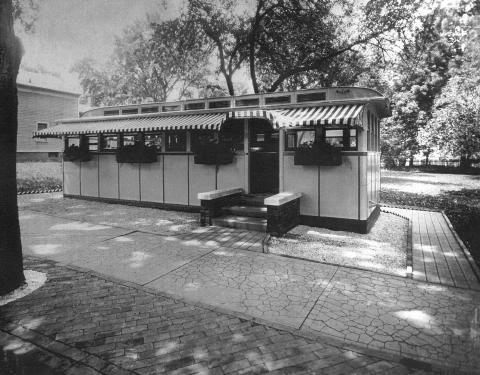 One was a barrell roofed diner, as seen in the second picture and the other was one with monitor windows, similar to Ward & Dickinson's model. This one is the first picture shown. Though, on this diner, the area where the ceiling met the end wall, was curved, instead of straight across like the W&D diners. For a listing of past and present known Mulholland Diners, [click here]. Literature - Below are two advertisements that the Dunkirk Historical Society has in their posession. I believe the top diner was in Dunkirk, and the lower one still stands in Brocton, NY, though covered over. It is partially original on the inside. Old Newspaper Articles - Pleasse scroll down to the bottom of this page for some newspaper articles concerning this dining car company. THE demand for good food, served cleanly, and quickly at reasonable prices is constantly increasing. The Mulholland Diner is designed to accomplish this at the greatest profit to the operator. Its most attractive appearance brings public patronage. Designed for easiest and most economical operation, when located on one of our selected sites, there is nothing which offers as large profits on the investment. The Mulholland Co., Dunkirk, N. Y. BASE SIZE - This is an entirely new type of Diner, different in construction, appearance and operating conditions. The base size of this Diner measures 10 ft. in width by 24 ft. in length, inside. VARIETY OF SIZES - Other lengths may be furnished in multiples of 3 ft., for instance 27 ft., 30 ft., 33 ft., 36 ft., 39 ft., or 42., all inside measurements. UNDER FRAME - The under frame is steel and constructed of two 10 in. steel channels the length of the Diner with heavy cross channels, with gusset plates and truss rods makes this frame the most substantial for the purpose. PILLARS - Our pillars are spaced with 36 in. centers and are bolted directly to the 10 in. channels, making a most rigid framework. ROOF - The roof is the oval type with a graceful curve and extends about a foot over each end of Diner, providing a pleasing balance. The roof covering is heavy oil duck, with an aluminum finish for the reflection of sun rays. The cross members of the roof are designed to provide a large volume of dead air space between roof and inner lining. PANELS - The outer panels are of steel, (finished auto sheets) and are of an uniform spacing, making replacement on case of accident both quick and inexpensive. MOULDINGS - The outer mouldings are a special dual construction, the outside or finish portion being oval and attached without nails, screws or putty, making a smooth, permanent finish, adding greatly to the pleasing appearance of Diner. WINDOWS - The sash is a single unit, with upper portion of Cathedral glass and lower part of clear glass. This single sash raised into the roof. FLOOR - The floor is 1 1/2 in. tounged and grooved and forms an integral part of frame. FLOOR COVERING - The floor covering is heavy inlaid linoleum of the best quality and may be furnished in a variety of patterns at the option of purchaser. INNER FINISH - The interior of the car including ceiling is finished in inlaid linoleum of the best quality. This is cemented under heavy pressure to insulating board, providing both insulation and finish of a permanent quality, which is quickly cleaned at slight expense. INSULATION - The Diner is insulated both sides of pillars making a double insulation of over an inch in thickness, equivalent to the insulation on low price refrigerators and assuring a Diner, warm in winter and cool in summer. This insulation plus our interior construction, greatly reduces the possibility of sweating. AWNING - The Diner is provided with a steel awning the length of front, this is of pleasing appearance and permanent construction, requiring simply repainting to renew its life and looks. FLOWER BOXES - Flower boxes are provided for front of Diner as our experience has taught us than an attractive exterior is necessary to draw tourists patronage. COUNTERS - The counters both front and back are of steel, with steel shelves, easily removable for washing in sink, this Diner is vermin proof and the most sanitary on the market regardless of price. INTERIOR WOODWORK - Interior woodwork is kept at a minimum, and is confined to necessary finish, mouldings and booth seats. This woodwork is stained and varnished, practically eliminating paint inside Diner and providing a finish which may be quickly and cheaply re-newed. SEATING - Our 24 ft. or base size Diner seats twenty people, 8 on stools at counter and 12 at booth seats in end of car. Longer units seat two additional for every 3 ft. increase in length of car. EQUIPMENT - The equipment on this Diner comprises the following. (1) Copper nickel played twin coffee urn (2-3 gallon); (1) steam table (monel metal) 2 compartments for roasts and six pots; (1) short order range, with griddle and hot plate; (1) large refrigerator for ice, electric unit may be added as net extra; (1) exhaust fan on roof; (1) small fan in end of car; (1) hood covering range and coffee urn; (1) 30 gal. water heater; (1) double sink with drain boards; (1) water cooler with soft drink storage; (1) pie rack; (1) eight day clock; drawers for bread, rolls, etc. VENTILATION - A heavy duty fan is located on roof over short order range, this is supplemented by a small fan located in end of Diner. WIRING - (3) ceiling lights; (22) ceiling plugs, one each end of car; (2) heavy duty plugs in back wall in front of short order counter; suitable switches, etc. The longer units have more ceiling lights. PRICES - The cash price of our base size (24 ft.) Diner is $3500.00. The 27 ft. Diner $4000.00. The 30 ft. Diner $4,500.00 all f.o.b. Dunkirk. On longer sizes we will quote on request. The quality should not be judged by the low prices quote on this Diner as these are based on our standardized and simplified construction and the production this high quality, low price Diner should make possible. TIME PAYMENTS - When the Diner is purchased on time payments, thee is an additional charge for finance and interest, with a down payment of not less than $1000.00, the balance may be distributed over two years in equal monthly payments. NOTES - No wheels or axles are a part of this Diner, which may be transported on a low trailer or special wheels and axles may be furnished to be removed and returned to us after Diner reaches destination. Charter Issued at Albany for $30,000 Corporation To Boost Sale of Dunkirk Product. A $30,000 corporation has just been organized to handle the sale of the dining cars which are being manufactured by the Mulholland Company at its plant in Washington Ave. Dunkirk. The new corporation has for its directors: R.J. Gross of Dunkirk, Roscoe B. Martin, Mathew P. Wilson, William H. Marvin, C. Warren Knapp, and Walter Record of Forestville. 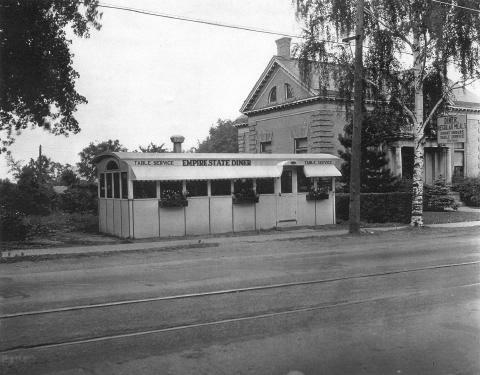 The corporation is to be known as the Dunkirk Dining Car Corporation and will begin operations at once. The car which the Mulholland company is making and which the new corporation will sell is said by those who have had experience in that, to be the finest car made. It is 30 feet long and 10 feet wide with seats for 18 patrons. It is a remarkably well built car, having an all steel bed or foundation and the woodwork, instead of just being nailed together, is jointed and fitted like the finest furniture. The outer sides are sheathed with metal and this, with the steel bed, makes the car extremely solid and durable. The interior of the car has been arranged with the greatest care and there is not the smallest available space that has not been utilized for some practical purpose. The refrigerator has been built in and is of a surprisingly large size. Ice cold running water is on tap at all times from an automatic tap at one side of the refrigerator. Next to the refrigerator is a space ready to hold a cash register. Then comes the various cooking stoves, griddles, and grates. Over this section there is a large hood and the entire section is kept ventilated and the fumes from the cooking operations are expelled by a large exhaust fan which has a capacity many times as large as is needed for the mere purpose of ventilating the cooking section. The usual arrangement of steam tables has been changed to make the system better adapted to dining car needs. The ordinary five gallon water heater which is usually found in such cars has been replaced with an instantaneous gas heater which furnishes boiling water as rapidly as needed. The water is piped to the sink which is located under the long eating table. There are two sections to this sink. One of them has a single faucet through any which water of any desired temperature may be obtained and the other has a perforated pipe run around the top and this throws a spray of boiling water over the dishes. The comfort of patrons has been assured in many ways. Comfortable foot rests have been installed on each of the eighteen stools and there is a coat hook back of each place. Nine windows or vents on each side of the top projection keep the air clear and provide plenty of fresh air. The top of the eating tables is of thick glass with a white coating which gives it the appearance of marble. Marble is not considered adapted to this work because it is so easily stained. All of the paint work inside the cars is well done and is of a quality which is not only durable but which is very easily cleaned. The best enamels and paints are being used. There are two doors, one on each side of the car and both are screened. Weather proof fittings on the doors and the outside of the exhaust fan make the car as practical in winter as in summer. Electric lights have been built in and plugs and sockets are provided throughout the car allowing the installation of gas or any other electrical equipment. The exterior of the car is lacquered in an attractive yellow. The metal sheathing is bound with aluminum bands and the appearance of the entire car is ornamental. The wheels and springs appear to be well made and have been installed with a view toward making the car easily handled. The Mulholland Company is still making its usual line of truck cabs and bodies, but in addition is devoting a large amount of space to the manufacture of the new dining car.